Soap has become an important component of human hygiene. The existence of soap-like materials since the Babylonian period has exemplified the sheer benefits an individual can obtain from the cleansing properties of the product. A lot of personal soaps in the market has promised complete cleanliness for people who will use them. However, most of these soaps contain harmful chemicals that can irritate the skin and cause sorts of problems. It is due to this reality that bars of high-quality natural handmade soap are slowly taking center stage. The greatest edge natural homemade soaps have over more contemporary products is the absence of chemicals. People often get irritated by the latter due to the mix of chemicals. Natural soaps usually use oil from natural sources like cocoa, avocado, and olives for a more skin-friendly product. Handcrafted soap, on the other hand, is made with a variety of natural ingredients, fragrance and oils that are known to lock in moisture and hydrate the skin. Most handcrafted soap makers are also respectful of nature by not testing their products on animals. A lot of natural soaps offer something most modern soaps cannot: an opportunity for healing. A lot of natural soaps contain the humectant glycerin, which can help fight burns, rashes, callouses, and psoriasis. Natural handmade soaps are perfect for people with peculiar skin profiles. Because handcrafted soap is made with natural ingredients obtained from plants, trees, herbs and flowers, their essential oils contain healing and curative properties in addition to natural aromatic fragrances. When such essential oils are added to these soaps, common skin disorders like acne, eczema and psoriasis can be treated. A lot of natural soaps are painstakingly created to perfection by their makers, so one can be assured of a high-quality product. These soaps usually end up looking like fantastic mosaics that can also become complementary pieces to a person’s bathroom. A lot of these soaps are aromatic in nature, which makes terrific all natural handmade soaps a perfect gift to loved ones. 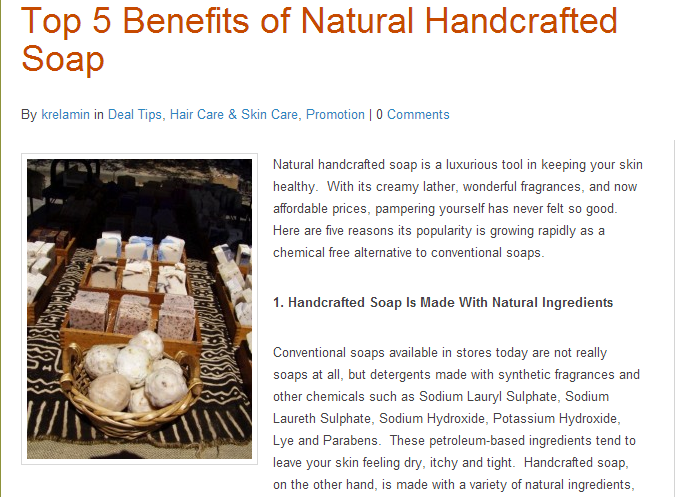 Natural soaps have a lot of things that their modern, chemical-loaded brothers cannot offer. Individuals interested in buying into the benefits of natural soap can contact reputable shops like Sea Foam Trading to learn more.